This is John Strype's first edition of Stow's survey. John Stow was a retired sailor who dedicated his retirement to gathering information from records and residents of the Georgian city. 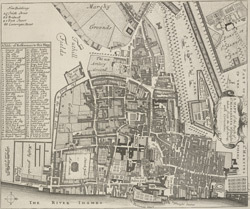 The survey extended to include London and Westminster in their entirety, capturing London between Restoration and 18th-century developments. The land on Mill Bank is denoted "Marshy Ground". Renowned for its unhealthy damp atmosphere, it would become the site of the infamous Millbank Penitentiary, and later Tate Britain. Above this a "New Church" is in the process of completion. This would become St John's. Although the survey proved popular, Stow died in poverty at the age of 80, having been granted licence to beg by James I.